It may sound paradoxical, but capturing the ultrafast motions of subatomic particles is actually very time-consuming. Experiments designed to track the dynamics of electrons often take weeks. Mapping the frantic gyrations of elementary particles entails the use of extraordinarily brief laser pulses, and low signal-to-noise ratios necessitate the accumulation of huge datasets over long periods. Now Physicists based at Ludwig-Maximilians-Universitaet (LMU) in Munich involved in the MEGAS Project—a research collaboration between Max Planck Institute for Quantum Optics, LMU Munich and the Fraunhofer Institutes for Applied Optics and Precision Engineering and for Laser Technology—have significantly reduced the duration of such experiments. The core element of their new technique is a novel enhancement resonator. Ultrashort, near-infrared laser pulses delivered to the cavity at a rate of 18.4 million per second are converted into extreme ultraviolet attosecond pulse trains, which are ideally suited for experiments in electron dynamics. 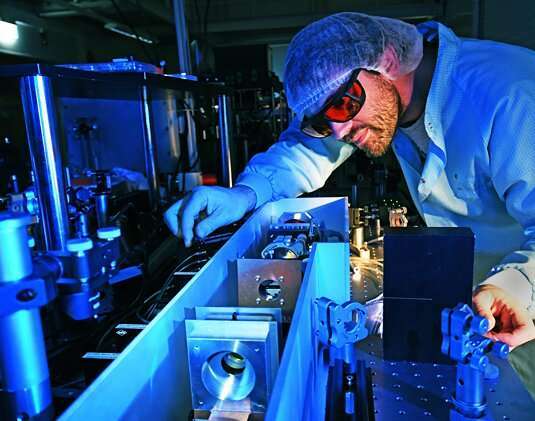 "The new laser source generates pulses at rates that are about 1000-fold higher than was previously feasible in this spectral range, which reduces the measurement times required by the same factor," as the leader of the project, Dr. Ioachim Pupeza, explains. "This advance is of considerable significance for research on condensed-matter systems. It also opens up new opportunities for the investigation of local electric fields in nanostructures, which are of great interest for applications in future information processing with lightwaves."